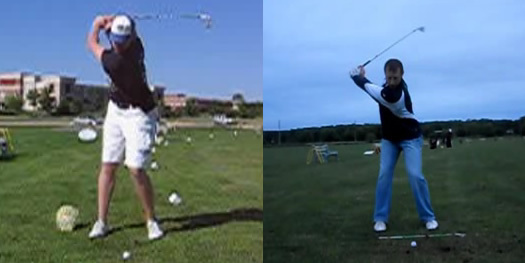 See for yourself the dramatic improvements our students have made in their golf swing mechanics! RotarySwing is the leading and most advanced golf swing improvement program in existence on how to improve your golf swing. Bold claim? Nope, completely backed by science and irrefutable fact, as well as a few THOUSAND testimonials of improved golf swings! RotarySwing is the only golf swing improvement program that improves your golf swing through a proprietary step-by-step online learning system. Apart from our amazing online learning system consisting of hundreds of golf instruction videos, you can purchase swing reviews for less than $8 and get your golf swing analyzed by a Certified RST Professional! Ready to try it out? Click here to join today! I've been a part of RST for the past 4 months, and it has improved my 15 handicap down to a 7 in that time. My swing speed prior to this program was 96 MPH and is now 115 MPH without seeing a day in the gym. See Our #1 Student's Golf Swing (So Far...)! I can't realistically see myself hitting the ball any better or more consistently down the range or on the course than I am now, and I understand my misses now as well. 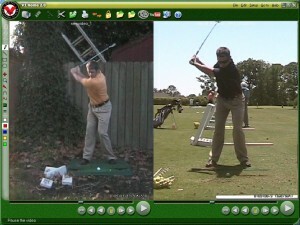 My golf swing improved dramatically following RST! Say GOODBYE to the "Chicken Wing" and Flipping! 1) They all have forward shaft lean at impact for every stock shot. 2) They all have great lag. See exactly how I helped this student begin developing both! Click here to read more about this student's story. 76.5 Degrees More Lag in Only 10 Minutes! This golf student loves to hit balls – for hours and hours – and couldn't anymore simply due to poor swing mechanics. One golf lesson was all it took to rid her completely of the pain in her elbow, and she said that she "loved the feeling of her new improved golf swing" because it felt more athletic and effortless. 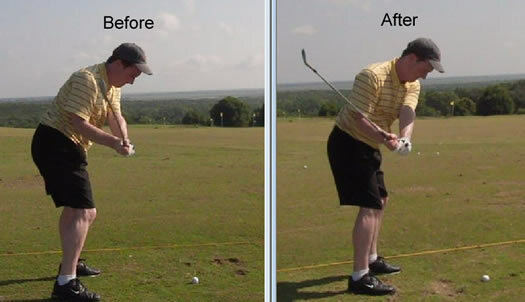 If you're struggling with golfer's elbow, or any other golf swing related injury or pain, know this – with the Rotary Swing Tour mechanics THE GOLF SWING SHOULD NEVER CAUSE YOU ANY PAIN – EVER!!! After a few minutes of teaching her to hit balls with her right arm and how to build lag in her golf swing, the results speak for themselves. This student practiced really hard for about a month and a half and made almost no improvement on his reverse pivot. After only two weeks of following the 5 step process you'll learn in this video, he achieved a solid top of swing position. The best part — he didn't have to leave his house. Handicap before RST: 9. Handicap now: 5. "Watching videos, getting online lessons from Chuck and Ray helped me a ton for things that I wasn't seeing myself. 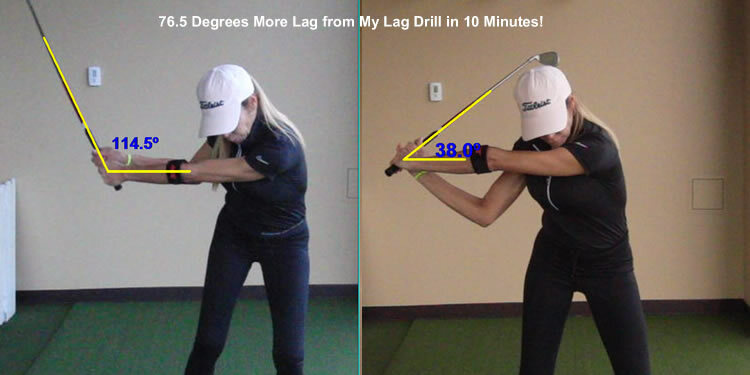 It's honestly the best money you can spend..."
Huge Golf Backswing Mechanics Improvements! I wanted to say that I am really pleased with the progress I have made, and joining the [Online Learning] Groups while working with Sam Jarman has really helped my game. I have my swing up on the swing analyzer under WI that shows swings from 09, 10, and then from last night...I think Chuck might be interested to see one of the students make some significant progress while getting no in-person lessons...I feel the confidence coming now. Click here to check out Matt's swings in our SwingViewer analysis tool (his swings are under Wisconsin). 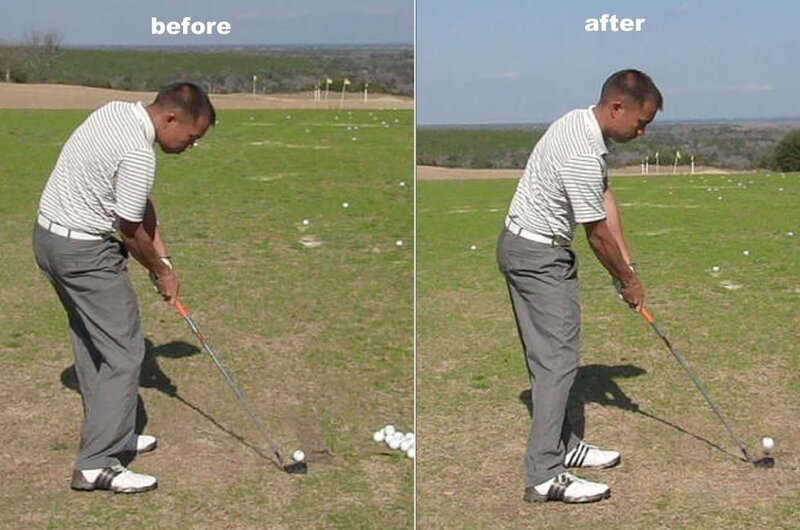 After working with the golfer for 30 minutes teaching him HOW to move, not just where to put the club, there’s a dramatic golf swing improvement in his takeaway. Halfway back, there’s no comparison. The image on the right is as good as Tiger Woods and absurdly better than where he started just 30 minutes before! See Greg's fantastic swing below. How You Can Pick Up 24 Yards (and Lag)! I gave a golf lesson this week where the golfer flew in to Florida from Texas for the sole purpose of increasing his swing speed with the driver. His average swing speed was 85 mph, and he felt like he had more speed to give, but the instructors he worked with in the past told him that he was maxed out. NONSENSE! in the one hour golf lesson, we worked on improving his lag, and he picked up 24 yards! 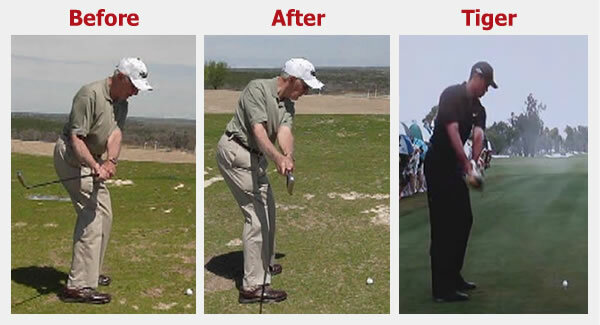 Incredible Golf Swing Improvement in ONLY 4 MINUTES! 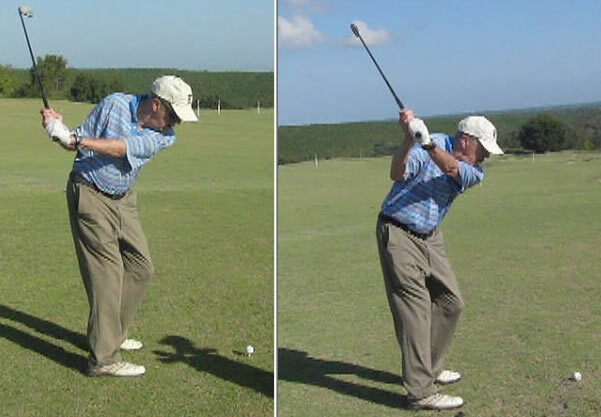 In 4 minutes—yes, I timed it—this 70+ year old golfer made such radical changes that it would be hard to believe if you didn't understand the underlying systematic approach of the Rotary Swing Tour. In the "before" picture on the left, Tom's clubface was rolled wide open during the takeaway (note the logo of the glove facing the sky). 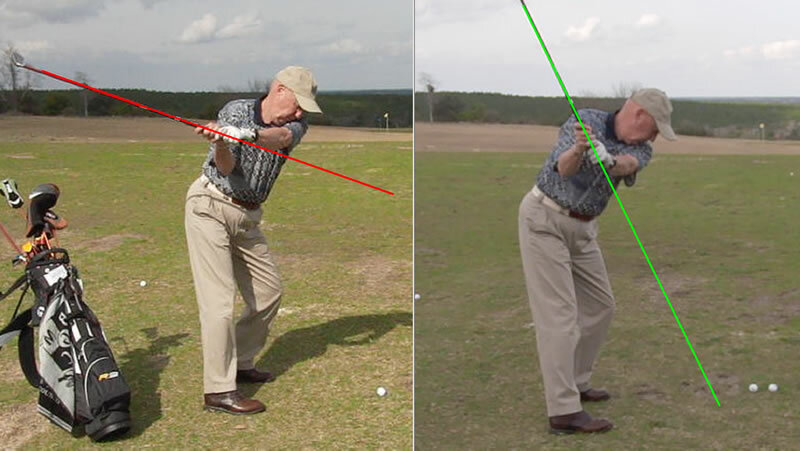 This internal rotation of the left forearm sent the club deep behind him and put him in a position that was almost impossible to return the club back to the ball. 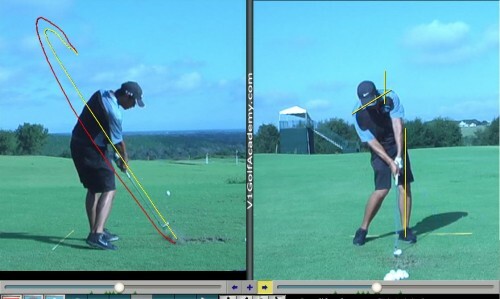 In the image on the right, he's in a picture perfect takeaway position after working through the concepts in the Takeaway and Backswing videos on this site. We've literally moved the club 3 feet(!) into a better position in 4 minutes by teaching Tom HOW to move correctly, not just WHAT to do. 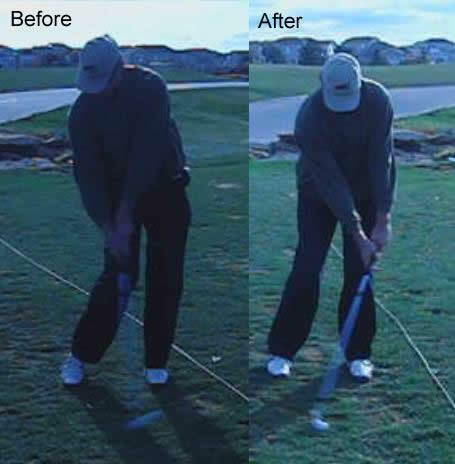 Below, his club was so flat in the "before" position (on the left) that bringing the club back to a solid impact position from there was almost impossible. 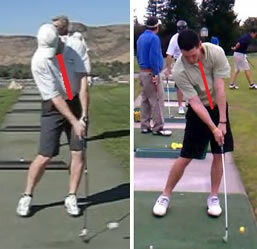 Now (on the right), his hands are more in front of his chest, the club is more on plane and his hips have rotated far less. Golfer Stops Coming Over the Top in One Lesson! 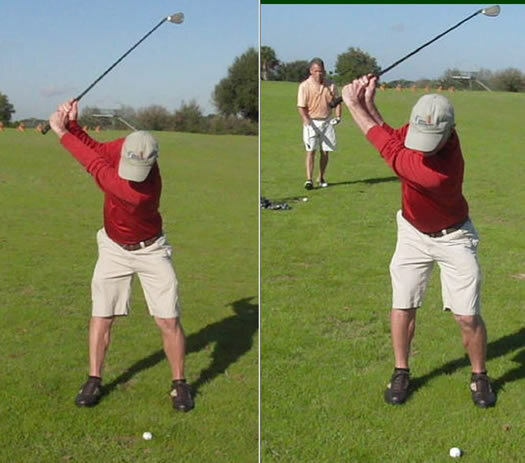 Here's a student going from a severe over the top move to getting more on plane in today's lesson. You TOO can make this huge change and stop coming over the top using the drills on the website in the Downswing section - Phase 5 video. Nearly a Model Impact Position! 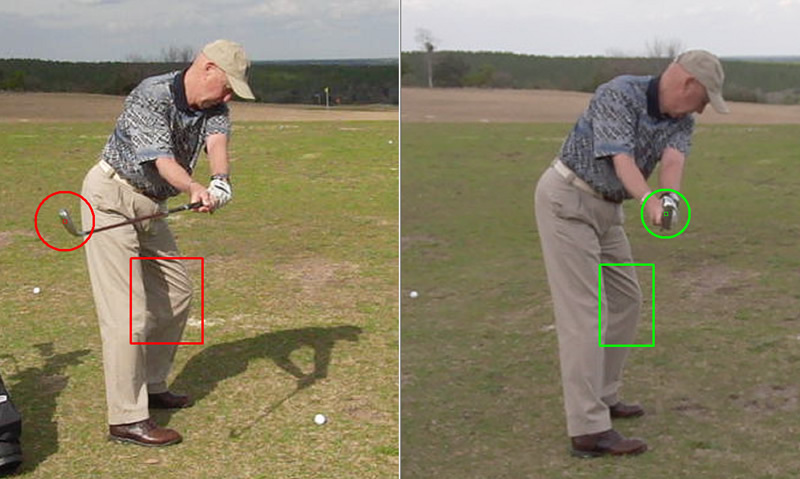 It's amazing the golf swing improvements that come about through these drills and learning the correct way to move. I haven't hit balls in a couple months and some of the few photos I got were some of the best I've been in. Pro Student and Teacher Demonstrate Ideal Impact! One of the defining hallmarks of the RST golf swing is getting into a perfect impact position, both biomechanically and from a physics point of view, every time. Here’s a pic of professional golfer Craig Morrow after his work this week with RST Founder, Chuck Quinton, at impact. Just for fun, we threw in a picture of Chuck at impact about 12 years ago in the middle and where he is today on the right. All we can say is “Ouch!” Good thing he invented RST or he wouldn’t be playing golf much longer swinging like that! After 20 years, golfer fixes swing flaw! I really want to thank Chuck and his system for doing something that no other instruction was able to do for me. 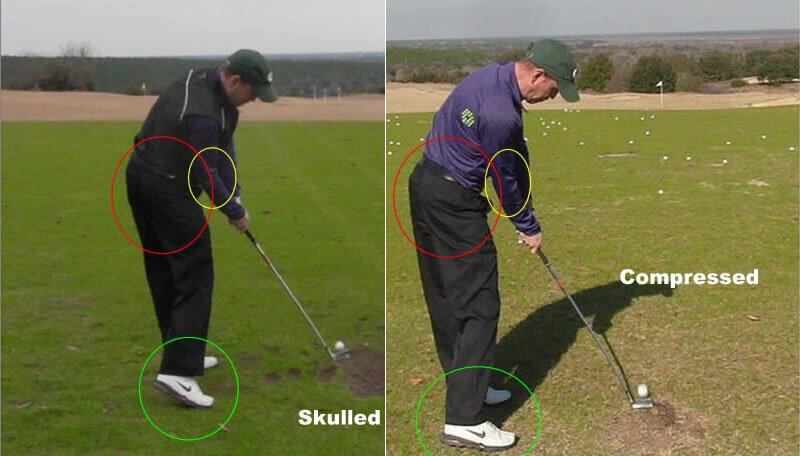 Using the fundamentals I addressed in the Impact Alignments - Face On video, this is a new golfer and very high handicapper's before and after impact position from a lesson in February 2011. Not perfect, but much improved! Click here to learn about the proper impact alignments. Huge Plane Improvement Using the RotaryConnect! RST student Frank from Canada working with the RotaryConnect to shorten his swing and get him on plane at the top. At the end of the takeaway, we moved his club about three feet; that's pretty dramatic improvement in one hour. Click here to see this student's full story in our "Learning How to Learn" video (available with Free Membership). 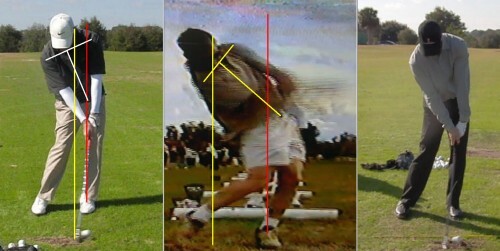 Dramatic Improvement in Club Path and Plane! On the left, our golfer Ian was approaching the ball severely from in to out and hit everything high and right to left. Halfway down, Ian's clubhead should be working down the yellow line, which is through the center of his right forearm, to be on plane. 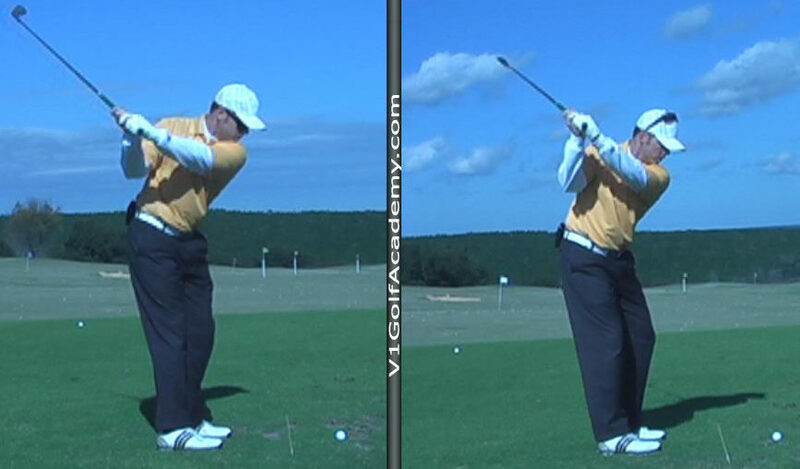 However, in the swing on the left, you can see the clubhead is almost behind his back pocket — well below the plane. After a few minutes of mirror work and helping Ian understand the problem, we were able to move the club almost a foot at this point in the downswing, we had his path much more square into the ball, and the ball was coming out much lower and right on his line with zero curvature. Clinic Attendee Learns to Compress the Ball! 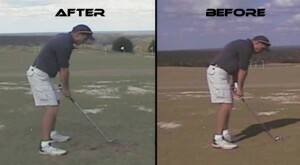 Check out this improvement at impact by one of our students who attended an RST clinic in 2011. Click here for more clinic info. Here's Raj, a pro golfer on the Indian PGA Tour who came over from India to work with me for two days. 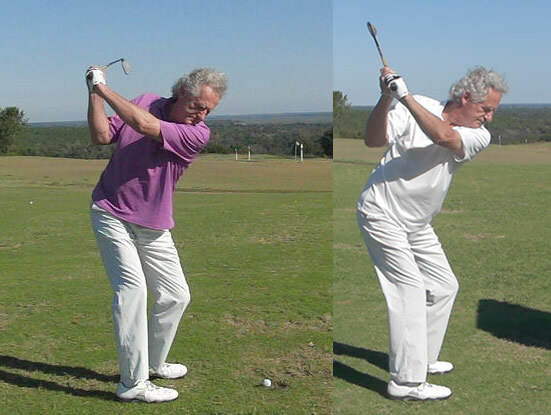 Raj had a very overactive right side in the golf downswing, both the right hip and the right arm, leading to big blocks and thin hooks with his very stuck arm position at impact. 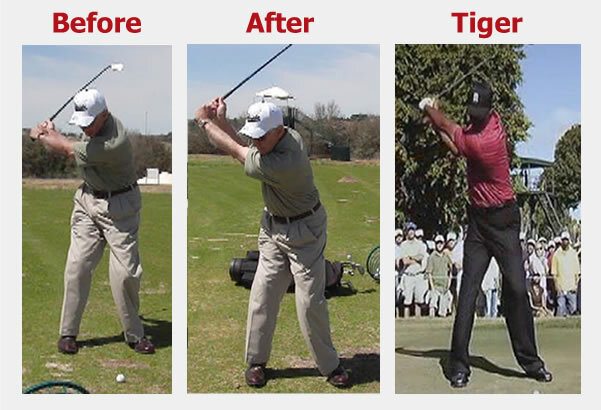 Professional Golfer Makes a HUGE Impact Improvement! 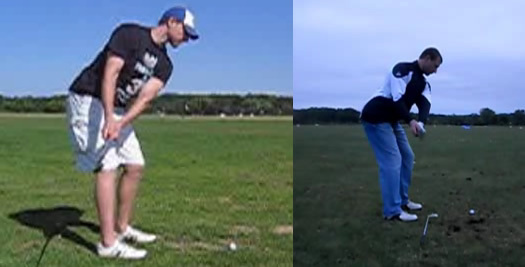 Professional golfer Kevin Belza came to see me this week (in January 2011), check out the HUGE improvement in his impact position. His shoulders are square to the target now, and his arms are fully extended. Student Increases His Shoulder Turn! 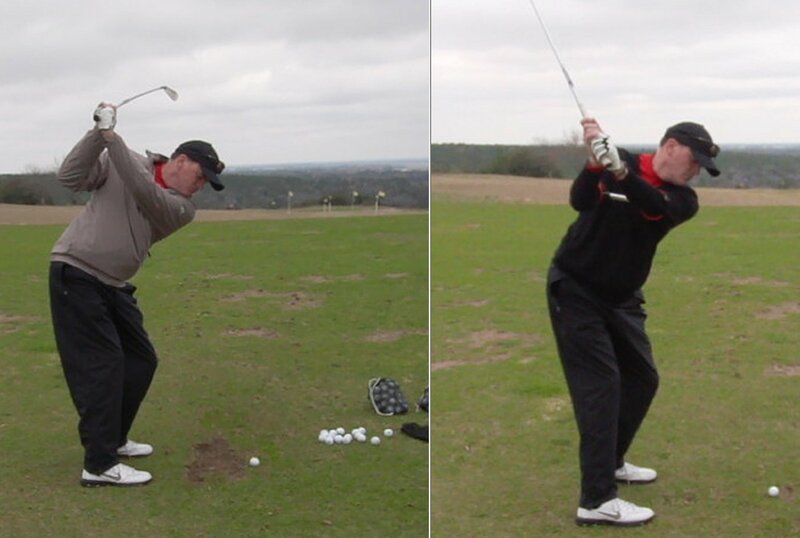 This student learned to rotate his shoulders further in the backswing using the RST system. Click here to learn about how to make a proper backswing. High Handicapper Eliminates Weak Hip Slide! 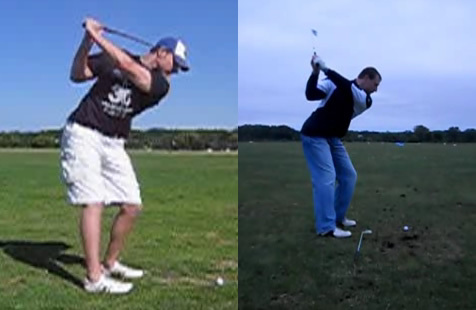 Here is a shot of his "old" top of the swing position he started with on the left and where he was at the end of the lesson (right). Dennis' homework is doing the 9-3 drill for the next week, and more importantly do it at home in front of a mirror without a club. His posture at address had him way out on the balls of his feet with a very rounded spine making it impossible for him to swing in balance and make decent contact. After 15 minutes of work, I think you’ll be impressed by the change in his posture. So here it is; the before Chuck lesson [on the right] and after [left]. Remember this is just a quick swing in the back with no warm up. I am very excited with what I see here and can’t wait for the next step. Single Digit Player Overcomes a Severely Flat Backswing! This student was lacking Shoulder Elevation, as he tended to turn his shoulders almost 70 degrees before he even started to elevate. 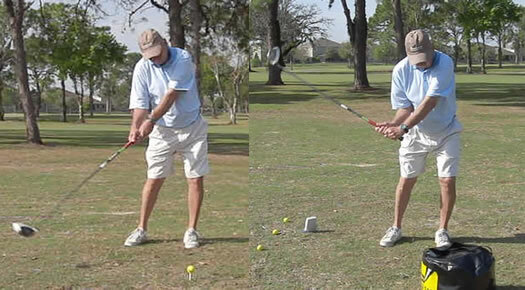 The club as a result worked too deep and around him in his backswing, as is demonstrated on the left frame below. The right picture shows his huge improvement. 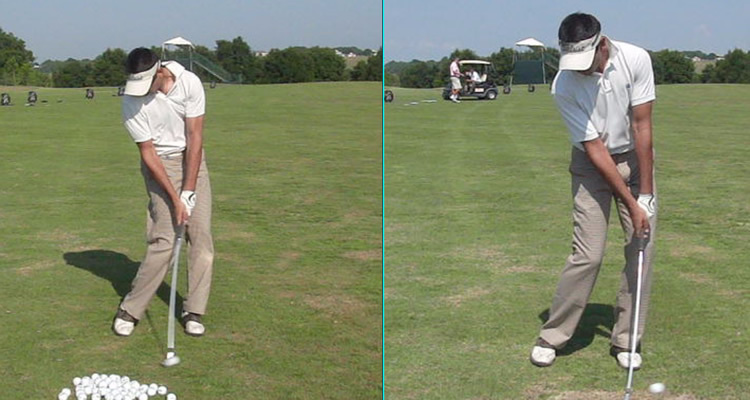 BEFORE: On the left side is a trace of Kris’s swing path. 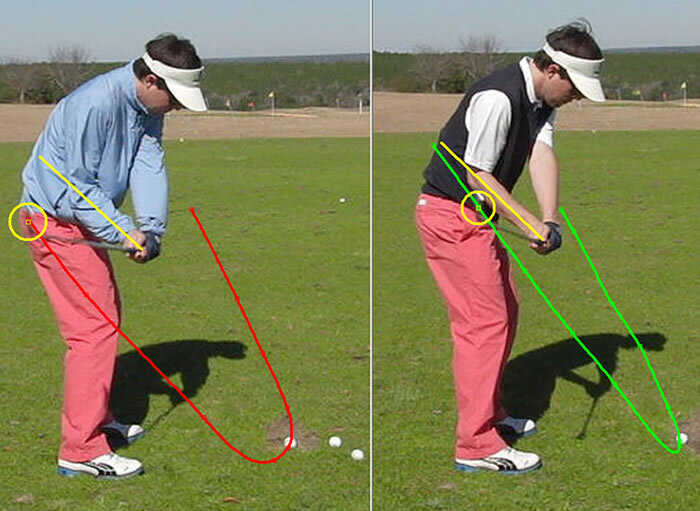 The red line represents his backswing, and the yellow line represents his downswing. It becomes quite clear Kris was over the top which resulted in many “wiped” shots that would weakly balloon and fade. On the right side, you can plainly see Kris’s failure to shift that left hip which left him well short of Neutral Joint Alignment (NJA). Kris’s weight is now trapped on his right side which results in the excessive axis tilt and his head backing way up as he comes into impact. He never covers the golf ball effectively, and fails to compress or flight the shot the way he desires. Due to his improper origin of movement, the more he would try to cover the ball, the more fat shots he would hit. On the right half of the picture, you can see Kris’s head has not backed up nearly as much, and the axis tilt is improved. Kris’s left hip has shifted toward the target before he unwinds the hips which allows him to get into NJA at impact. Increase Your Lag Like This Student! 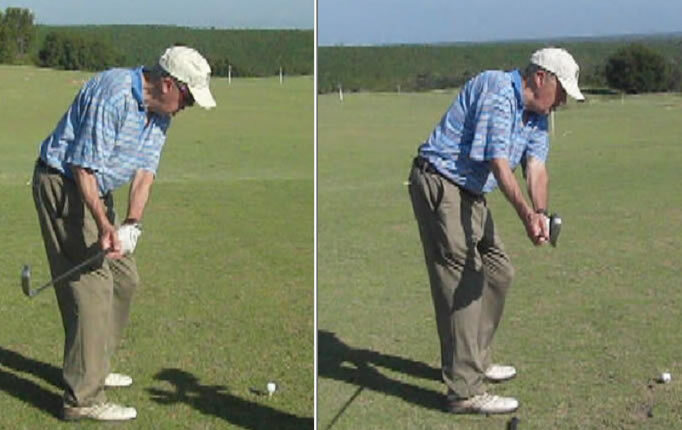 A few weeks ago, Frank joined my learning group, and I noticed immediately his problems of losing lag and having a slight sway in his backswing. After a few online reviews of his swing, he picked up about 30° of lag! Here's an example of a recent student who came to work with me from Thailand. 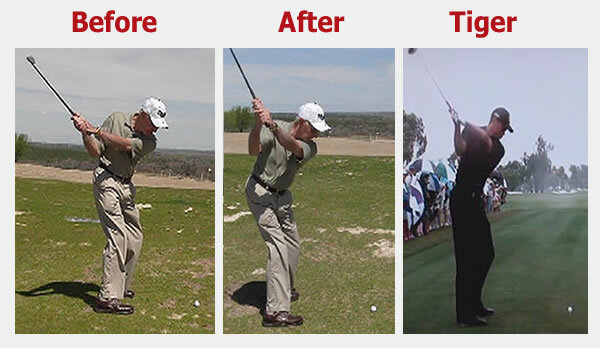 As you'll see, he went from a horrible, across-the-line position at the top to a near-perfect position in just one lesson using the REF method from the "5 Minutes to the Perfect Backswing" video.